Sweden was always a country I wanted to go to. I had heard how clean it was, how safe it was, and how beautiful the people were. Additionally, I have always loved stories and movies about Vikings and the Nordic history and culture. I landed at Arlanda Airport and took the Arlanda Express into town. It takes about 20 mins and costs about 250 Krona (KR). KR is the name of the currency used in Sweden. If you have time to spare, I recommend taking a bus as it is the cheaper route. Furthermore, they are really very nice and have WIFI to utilize. Another way to save is to book the Arlanda Express online prior to your arrival. I arrived at Stockholm Central Station and took an Uber to my hotel. Ubers in Stockholm are very expensive. I’m not entirely sure why. Perhaps because in Sweden the Uber drivers have to have a taxi license. In addition, because of the pedestrian streets, I found walking was normally just as quick if not faster than taking an Uber or Taxi. I also discovered how to use the metro which I highly recommend as it is easy to navigate and super cheap and effective. My first stay was at HOTEL BIRGER JARL. I arrived early and my room wasn’t ready so I had a nice lunch and a cup of tea in the hotel café/bar which was really trendy and nice. The lunch was great and quite cheap compared to some prices I had seen. Scandinavian countries are known to be quite expensive so I was quite happy with my lunch special. After checking in, I was upgraded to a suite and wow, it was huge. The room consisted of two bathrooms, a walk-in closet, and a seating area. The wallpaper is super fun, and the bed was exceptionally comfy. The room as a whole was colorful and happy. I really loved the vibe. The room was clean which again is especially important to me when staying in a hotel. After settling in I got up to site-see and walk around. HOTEL BIRGER JARL is in a great neighborhood and you can walk down the main shopping street past all the shops and trendy restaurants. I really liked this hotel and would come back especially for the lovely breakfast buffet in the morning that is included in your hotel price. 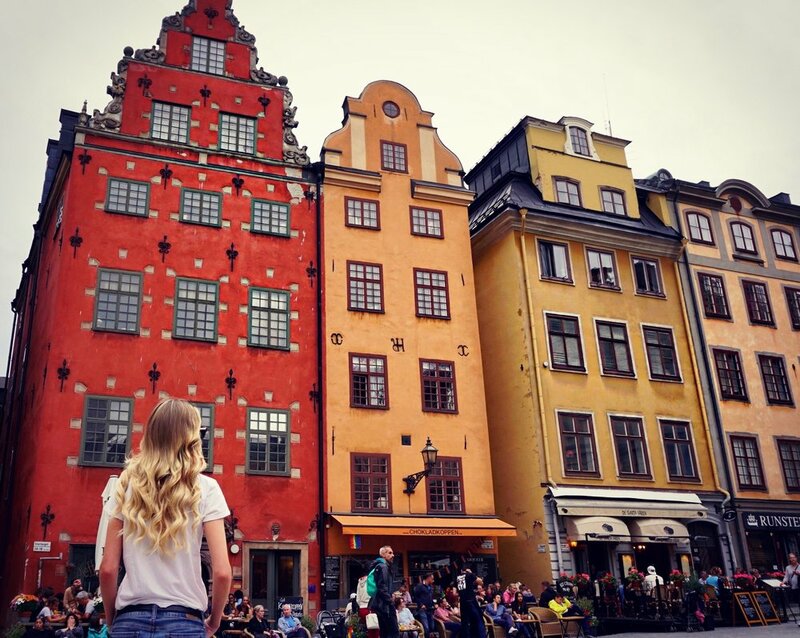 My first day, I walked all the way to Gamalstan in Old Town. I took time to explore Old Town and all it has to offer. It was my favorite part of the city! It reminded me of an old storybook or a Disney film with lovely architecture. Each building was a different bright color. There were so many cute shops and restaurants and there were a bunch of little alleyway/side streets with lovely views and shops. It was like a secret walkway of beauty. I could not stop snapping photos during my walk around Old Town. I then made it to Stortorget Square. It is the oldest square in Stockholm and so cute. It is probably the colorful square in photos you see when googling or Instagramming Stockholm (I took plenty photos in it also). I stopped and had a carrot cake (the best I’ve ever had) at Kaffekoppen. It was expensive but worth the price! Typically every restaurant or café in a tourist area is pricey anyway and it truly was the best carrot cake I had ever eaten. I always recommend when traveling to walk out of touristy areas as the food is always double the price and generally not as yummy. I then left and walked around the Palace and the waterfront. I really didn’t realize how beautiful Stockholm is. The buildings are so colorful and pretty. The walk around the water was so relaxing and lovely and again, great for photo taking. I sat across from the Grand Hotel and got a lovely photo. I would suggest really just getting out and walking around the city as that’s truly the best way to see any city. The next day I switched hotels and neighborhoods altogether and headed to HOTEL RIVAL. What an awesome and hip hotel in a super cute area! There were a beautiful fountain and park right in front of the hotel. The hotel lobby was certainly trendy with beautiful fun artwork and bright colors. Additionally, the bar and restaurant area were stunning. The staff was great and my room was so fun. I loved this hotel the most. I had a balcony with beautiful views of some lovely Swedish apartments. My bed was exceedingly comfy and I had an amazing bathroom with a big bathtub and huge fluffy bathrobes. I was so tired from working that I stayed in my hotel room that night, snuggled up and watched a movie, and went to sleep. It’s such a good and bad thing to love your hotel room so much as you are in a cool new city and you want to see the sites, but you also are so comfy in your room you want to sit in a robe all night and snuggle up in bed. The following morning, my third day, but second site-seeing day, I actually met a friend off Couchsurfing to meet with for a coffee and maybe to do some site seeing. Couchsurfing is a website where you can find people to host you in their homes for free if you are traveling or you can just get on it to meet other people traveling that happen to be in the same city as you. I know, it seems dangerous, but there are a lot of safety precautions on it including individuals being rated. You can also read reviews from people who have hosted, been hosted, or have also met up with that person. I generally always make sure someone has at least 5 reviews and that all their reviews say they would “surf” or “meet up” with them again. You also verify your ID. He was nice, was a marine from Florida, and we went to the Vasa Museum which was really cool! I didn’t have much of a budget to see everything, but I thought I would treat myself to one museum. It was around 12 dollars so no biggie. You can get student discounts on city passes and museum passes if you’re a student with a student card and you can also get museum packages discounted. I highly recommend emailing or calling tourism boards for information and tips. I know, this sounds old-fashioned considering they all now have social media and websites, but I truly think there is nothing better than real human interaction. You never know, they may slip you a free pass or two if you review or post about them online and how they helped you. After the museum, we walked to Katarinahissen and Eriks Gondolen for some stunning views of the city. These are good at night as well. We then went for a stroll through the markets, me, of course, stopping at the flower stalls, as I am obsessed with flowers. We then road bikes around the city and just truly took in the views and the atmosphere. There are so many lovely pubs and cafes. If I had more of a budget, I would have stopped at some of the cute places on the water as we were traveling to the museum corner. Also, there are many cute outdoor restaurants if you’re looking for a nice lunch. We finished our day out by stopping for Swedish sour taffy and wow was it good! I have such a sweet tooth! I remember while being there, I was so annoyed at myself for only having two full days in Stockholm to site see (I was there another day but for work). You can see everything in two full days, but I would spend three just to take in the city, take your time to shop and eat and to enjoy the cleanliness and beauty of the city with great food, lovely views, and stylish friendly people. Remember, although Donald Trump tries to make Sweden seem like this dangerous place full of crime, I’ve never felt safer walking solo as a female back to my hotel at night as I did in Sweden. 1. As mentioned above, do your best not to use Ubers or taxis in Stockholm. They are so expensive and will drain your budget. Buy a travel card that gives you unlimited rides on the metro for 24 hours or 72 hours. You can also use buses or the public transport system in Stockholm is very good, safe, and clean. The metro stations are also really cool and have random artwork and sculptures throughout them. You will get a taste of art while getting to your next area of the city. 2. I would buy alcohol in duty-free on the way in or at the Systembolaget (hours are generally from 10am-6pm). Alcohol, like a lot of the Scandinavian countries, is really expensive. 3. Take time to “Fika.” Fika is a tradition where Swedes take time away from work to socialize with friends and grab a coffee, sweets, or cakes. The Cinnamon roll (Kanelbulle) is the most common cake to have on a Fika. This is why I had a hot chocolate and carrot cake two days in a row after or during site seeing. It really is a tradition I love. 4. You don’t need to tip. If you feel your server went above and beyond then why not, but the servers here make a great wage and there is normally some type of service charge in your bill so tipping at restaurants is actually rare even if they say to fill in the tip. You can write 00s, as I noticed they did this with me because I was American and we are used to tipping, but I watched them not do it several times to Swedish locals so be mindful that again tipping is not at all expected. 5. You can use credit card everywhere, but if you want to use a public toilet I would have a few coins on you as it will cost you. 6. There are so many museums but I truly think the best is the Vasa from what I was told by locals. I was also told the ABBA is great. Stockholm has over 70 museums, but not all are created equal so do your research as to what you really want to see. 7. If you do plan on taking all public transport and seeing a bunch of museums then get a Stockholm City Pass as that will end up paying for itself after all the free transport and museum entry’s you’ll get. 8. Like many Scandinavian countries the water is fine to drink from the tap so bring your own water bottle and refill it in your sink to save on bottled water. 9. Don’t expect hotel staff to open doors and carry your luggage. It may seem disrespectful, but this is just the Swedish way. It is seen to some as even degrading. 10. Bring a sweater as the sun can be out, but it does get chilly. It also does rain often but most hotels carry umbrellas. If you plan on staying at a hostel or couch surfing, perhaps pack a light poncho or umbrella. 11. The month of July is maybe the worst time to come as a tourist. While the weather is lovely, a lot of businesses and restaurants close for their staff to get 4-6 weeks of summer holiday. 12. While Swedish is the native language, 9 out of 10 Swedes can speak English. Perhaps learn “please” and “thank you” in Swedish as the locals really appreciate that. 13. If you do decide to go on a night out then check out an ice bar. They’re really fun experiences. I’ve always loved them. 14. If you have the time, do the Archipelago Boat Tour. I really wanted to do this but didn’t have the time. 15. Bring your eye mask and melatonin. In the summer, you get around 21 hours of sunlight! The sun sets around midnight and starts to come back up around 230am. 16. There is free WIFI almost everywhere so don’t worry about missing that Instagram post.